Are you looking for Muskingum County heating and cooling repair experts that you can depend on to fix all your heating and cooling issues correctly, on time, and affordably? If so, give the HVAC professionals at Thorne Plumbing, Heating, and Air Conditioning a call today! We just hit our 50-years-in-business mark and we’re stronger, smarter, and more equipped than ever to handle any HVAC problems you have. Any of these issues can be extremely frustrating for a homeowner to deal with. Some of them are simple issues with simple fixes, but others may require professional services to provide Muskingum County heating and cooling repair or even replacement of the heating or cooling unit. You can check out these quick and easy heating and cooling repair tips from Trane, and see if any of them might help your situation. If they don’t, feel free to give us call if you need any Zanesville Ohio heating and cooling services. We’re here to help whenever we can. When your furnace isn’t working, which usually happens on the coldest day of the year, you might start to panic. While that’s a common and natural response, you shouldn’t let it get the best of you. Step back, take a deep breath, and tell your brain to think logically for a second. Start with the easiest troubleshooting steps first –checking temp setting, breaker, etc.– and if none of them work, gather the fam, bundle them under some comforters, and give Thorne a call. We offer emergency services for just this type of occasion. 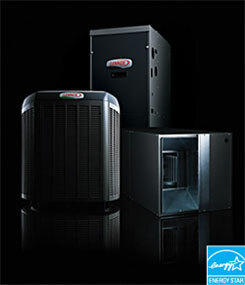 In case you end up needing a whole new unit, check out the furnaces at Lennox.com. We’re your local Lennox dealer, so we can safely and professionally install any unit you’d like. If it’s your air conditioner that’s causing you problems, go take a cold shower, jump in the lake, or spray yourself with the hose. Once you’re cooled off, check out this in-depth, but easy to understand, central air conditioner troubleshooting guide. If nothing on the list solves your problem, call the Muskingum County heating and cooling repair experts at Thorne – we’re here when you need us! We believe everyone deserves to live at a comfortable temperature, and we strive to provide complete customer satisfaction at every turn. Your comfort is important to us, so call the friendly HVAC specialists at Thorne for all your Muskingum County heating and cooling repair needs, and don’t forget, we also offer plumbing services! This entry was posted in Heating and Cooling Services, Muskingum County on August 4, 2015.